At Our National Cathedral, Darth Vader is "Up and to the Left"
St. Luke, I am the.., er, your Father. 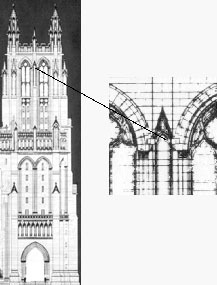 IT IS BOTH STRANGE AND YET COMFORTING TO KNOW that a grotesque of Darth Vader graces the facade of Washington's National Cathedral, but somehow I don't expect the ACLU to take the Cathedral to task for this infringement of the separation of Church and Empire. On the other hand, anything that enhances George Lucas' ego cannot be healthy for children and other living things. To Find Darth Vader you have to leave the building through the ramp entrance. This is located at the northwest corner of the nave, through the double wooden doors of Lincoln Bay. Go down the ramp, and step into the parking lot. Then, turn around and look back up at the tower closest to you. He is almost impossible to see without the assistance of binoculars. Way way way up, almost at the top of the tower is a gablet, or small peaked roof, located between the two huge louvered arches. At the bottom of each slope of this gablet is a carved grotesque. Darth Vader is on the north, or right-hand, side. 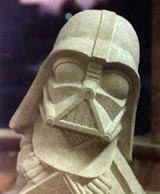 There is a carved skull situated on a gablet much closer to the ground which many people often mistake for Darth Vader. From this skull, Darth Vader is up and to the left.